Cabin rental reservations available for 2019 now! Whether you're bringing a huge group or just a few friends, you’ve come to the right place! We are available to host large full camp rentals as well as individual, church, non-profit and other family rentals. Camp Chickagami is the perfect spot to spend your summer months. Our campus is laid out along the shore of Lake Esau, a quiet lake with friendly neighbors. Go for a swim at the water front, take out a canoe, go for a hike - the possibilities are endless. Our surrounding community is a great place to explore, especially the two Lighthouses. Camp Chick is also a great place for a personal fall retreat. Our season wraps up in mid-October. Come and walk the colorful trails littered with crunchy leaves. Sit by a cozy campfire at night. Take a canoe out on a quiet, sunny afternoon. Fish from the docks or a rowboat. Read a book curled up in front of a fireplace. Play cards and munch on popcorn while looking out, thru the large picture windows in the lodges. Take some time away! Camp Chick is the perfect spot for a family vacation. We have several cottage-style cabins to choose from, including sleeping rooms, living space, kitchens, and bathrooms. Price varies depending on accommodations. Camp Chick can host over one hundred people at a time. We offer both cottages and dorm-style sleeping accommodations as well as large-group space. Price varies depending on group size and accommodations. Camp Chick is the perfect place for congregational retreats whether its the vestry or the whole membership. If you'd like to work with camp staff on retreat facilitation, please contact our Executive Director. 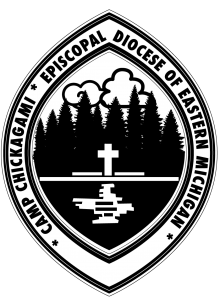 Camp Chickagami is the Family Camping Center of The Episcopal Diocese of Eastern Michigan. It serves Michigan Episcopalians and other church and community groups as a site for religious camping, education and recreation programs. Our one hundred acres command the entire north shore of Lake Esau (on of Michigan’s most attractive small lakes) together with substantial frontage on Lake Huron’s beautiful Albany Bay. Most of the Camp is heavily forested and shelters several varieties of rare or endangered wildflowers. Camp Chickagami’s location “off the beaten path” provides a secluded environment, dark and starry nights and relative absence of intrusive lake traffic. Absolutely! We have space available to all. Camp Chickagami offers three types of sleeping accommodations: lodges with full bathroom and cooking facilities; dormitory style rooms or cabins with common bathrooms a short walk away; and tent or RV sites with baths nearby. Our sleeping units are comfortable but rustic. Camp Chickagami is for those who want to spend most of their time outdoors enjoying “God’s garden” and the fellowship of friends. Don’t expect resort accommodations! Esau Lodge and Huron Lodge are located directly on the lakefront. Both offer living room with fireplace, two bedrooms, full bath, kitchen and screened porch. Esau has one double bed and three singles. Huron has one double bed, one single bed and two sets of bunk beds. Grand Lake Lodge is located at the other end of camp and away from the waterfront. It has one bedroom with a queen size bed. It also has a kitchen/dining room, full bath with a tub/shower and a living room with a view of the lake. The living room has a double sleeper sofa. Lighthouse Cabin, reserved for adult use (or small family), is a bright high ceiling single room near the dining hall. Ramps provide easier access for campers with mobility limitations. Lighthouse sleeps 4 with a double bed and a bunk bed. The common bath/showers facility, “upper unit head” located nearby is also ramped. Kauffman and Johnson Cabins are adjoining cabins located directly on the lakefront above the boathouse. These cabins are heated and can be used all year. Johnson features a large picture window overlooking Lake Esau. Johnson has a double bed, bunk bed, sleeper sofa and a couch. It has a large kitchen and bath. Kauffman offers a living room with a sleeper sofa, two couches and a bunk bed and a bedroom with a double bed. It too has a large kitchen and bath. A locking door separates these units when two parties desire privacy or both cabins are rented individually. The lakeside deck is for use by all guests staying in these adjoining cabins. The Lower Unit structure includes six individual carpeted rooms: Mary, Martha, Naomi, Sarah, Ruth, and Rebekah. Each of these rooms has 4 sets of bunk beds that can be separated into single beds. All Lower Units, except Naomi, have picture windows over looking the lake. Bathsheba is a handicap accessible bath/shower facility with laundry room located directly behind the Lower Units. Adam and Eve Cabins each sleep 12 in 6 sets of bunk beds. They also located nearby the bathhouse, Bathsheba. They are surrounded by trees and are vinyl sided. These are our newest buildings on site. Woodland Units are three heated cement block cabins located in the woods a short walk from the lakeshore and the dining hall. Matthew and Mark are dorm style units that sleep ten in wooden bunk beds. Luke offers a living/dining room with efficiency kitchen with hot running water. Luke has two small bedrooms with a double bed in one and one set of bunks in the other. The Woodland bath/shower building, John, serves all three of these units. There is a pavilion with an outdoor grill and tables located in front of these cabins. What group facilities does the camp offer? Camp life centers around the Dining Hall and the Chapel, located on Lake Esau’s shore. Fletcher Hall seats 120 for meals and makes a pleasant place to read by the fireplace, work jigsaw puzzles and stage rainy day recreation. St. Andrew’s Chapel is a lovely outdoor worship area with an historic stone altar, rustic seating and farm bells to call campers to worship. In foul weather worship can be held in Fletcher Hall. Our Swimming Beach on Lake Esau is a short walk from the Camp’s center. Its sandy, gently sloping bottom makes it ideal for swimmers of all ages and skill levels. Two rafts are provided and canoes, paddleboats and rowboats are available at the Kauffman Building. Lee Athletic Field is ideal for sports and games. Here you will find a tennis court, baseball diamond, half court basketball area, and volleyball. The Craft Hut is a large structure set aside for “creative messy” activities inappropriate in other buildings. Many Trails through the woods and to Lake Huron are available for hikers and walkers. Campfire Sites are located by Fletcher Hall and on the beach by the Pioneer Unit. Click to download our Rental Terms & Conditions. Rental groups must staff their own programs. Does Camp Chickagami provide a lifeguard? We do not provide a lifeguard. Adults must supervise their own children on the waterfront and we strongly recommend that groups have a qualified Water Safety Instructor (WSI) in control of all waterfront activities. Through more than seventy years as a diocesan institution, Camp Chickagami has never suffered a fatal waterfront accident. We do not want you, your child or a member of your group to be the first. Groups do their own food purchasing, preparation and clean up. Most groups prize “KP” (Kitchen Prep) as a great opportunity for fellowship. Is it okay to move furniture to better accommodate our needs? Yes. You must notify the on site staff member is notified and EVERYTHING must be moved back to its proper location before you depart. If the furniture is not returned, your damage deposit may be forfeited. We reserve the right to be incredibly hard-nosed about this! Aside from general housekeeping throughout your stay such as doing your dishes and sweeping your floors, Camp Chickagami takes care of the rest! All cabins and other buildings or gathering spaces will be professionally cleaned between stays – this allows you the most time to enjoy your stay at camp! Can we use the boating equipment? Yes! If you’re renting part of the camp, you have access to any and all of our boating equipment. You may be sharing with another group so please be considerate. Children must be supervised by adults and must wear life preservers. Will we have access to a telephone or WiFi? Sorry, no. We don’t have a public phone or WiFi connection. In an emergency, the phone in Albany is available. Over the years, cell phone reception has greatly improved in our neck of the woods. WiFi access is available just a short drive away at the Presque Isle Harbor. Sorry, dogs are not allowed at Camp Chickagami. Exceptions will be made for service animals. Please contact McKenziefor our full dog policy.